Yacht Stability: This is a critical safety issue facing Yacht Managers, Owners, and Captains. 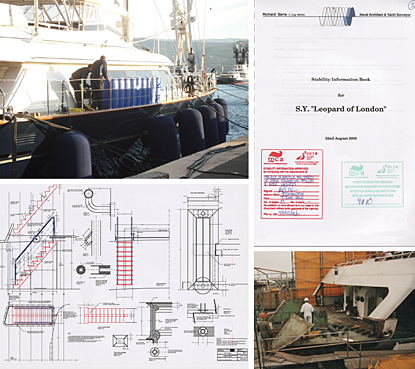 In order for vessels to be brought into commercial operation for charter, an up-to date stability booklet is required for approval by class or flag state. Furthermore for a vessel to be maintained in class, or for ongoing commercial code compliance certification, periodical lightship checks or inclining experiments are usually a requirement. This is also the case when a vessel has undergone a refit or significant modification, which may have had an effect on her stability. Yachtsurveys.com have conducted inclining experiments and produced high quality stability data for a wide range of vessels from small craft to superyachts. Their inclining experiments and stability booklets have been approved by major flag states and classification societies including the MCA, Cayman Islands, Isle of Man, Llyods, ABS, BV, DNV and RINA. Using the latest computer modeling and naval architecture software, reliable comprehensive stability data is produced and presented in an easy-to-read format. Yacht Design: With a background in Naval Architecture, Yachtsurveys.com are able to undertake design projects for owners wishing to make modifications to their existing yachts. Being able to draw upon the expertise of established stylists and interior designers within the industry a diverse range of projects can be undertaken.